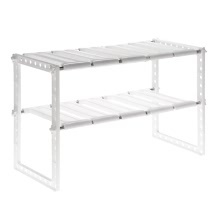 This is a multi-functional storage shelf for your home organization. It is quick to assemble and can be used as under sink shelf, kitchen/bathroom storage holder, shoes rack or bookcase. With this product, your kitchen will be more organized and have more space to storage things, perfect for limited places. Why not get it immediately? Apply stainless steel + plastic, anti-rust & sturdy to use. It is wide extendable, and tier distance can be adjusted. Multi-use as: under sink shelf, kitchen/bathroom storage holder, shoes rack or bookcase. With movable panels to suit your sink position. Suitable for kitchen table, under sink, living room, bathroom and bedroom. Package Size: 41 * 26.5 * 6.5cm / 16.14 * 10.43 * 2.56"